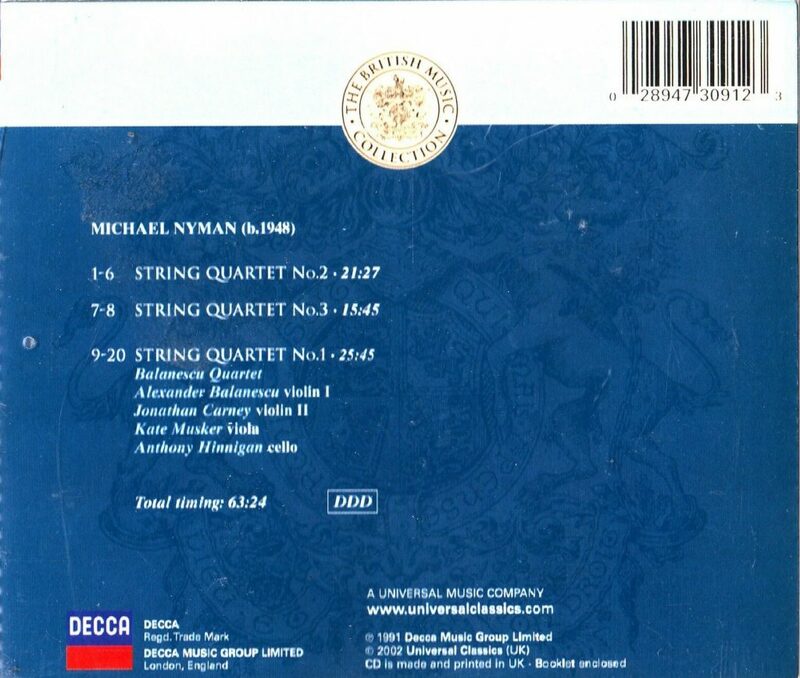 For the little that I knew of it, I didn’t particularly like the music of Michael Nyman before buying this disc. It’s not the repetition I minded, it’s the saccharine harmonies, the music all-too conspicuously pulling on the sentimental strings, the impression of hearing a sub-par derivation of Phil Glass when Glass is a sub-par derivation of himself. 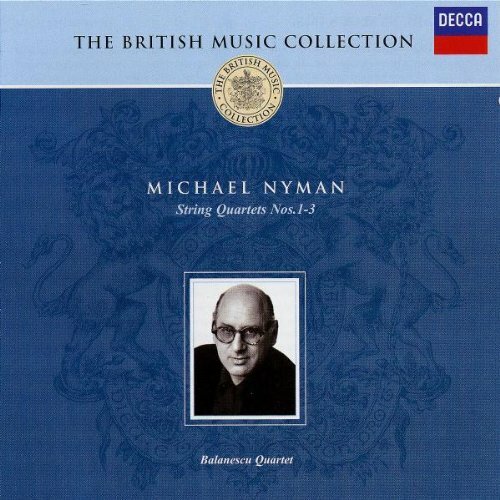 And that’s also why I knew fairly little of the music of Nyman: no incentive to try more. But I wanted to complete my collection of CDs from Argo, a sub-label that Decca established in the 1990s, and I’ve enjoyed the three String Quartets. 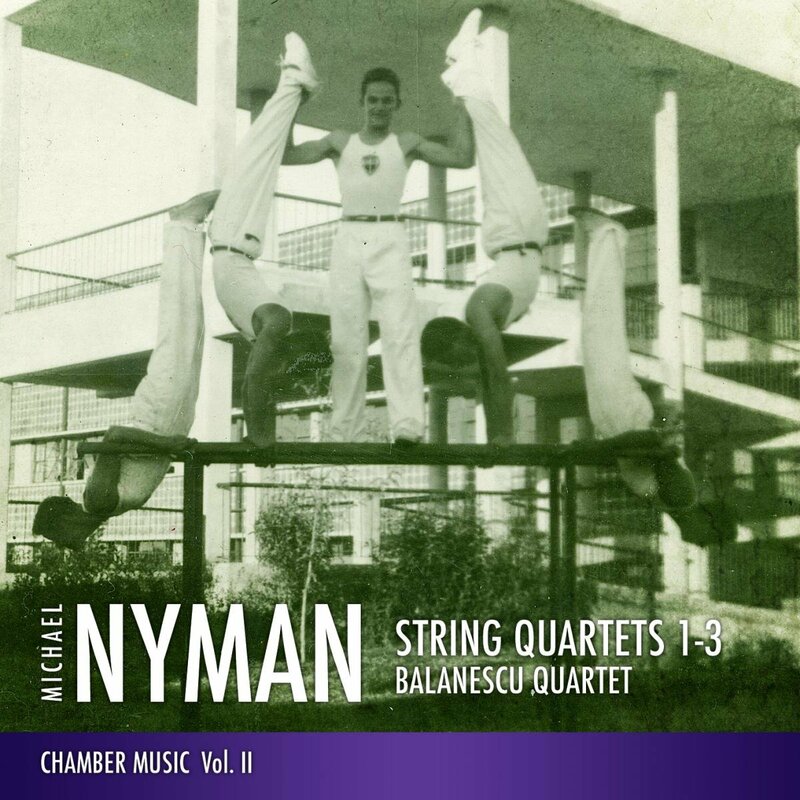 The music is upbeat, syncopated, dance-like, exciting, unfolding tremendous rhythmic vitality (especially in the Second Quartet, the most typically repetitive of the three) and tension-filled in sheer doggedness of its repetitive processes, even irresistibly jubilant and coruscating in many sections of the First String Quartet (written in 1985 for the Arditti Quartet – the other two are from 1988 and 1990, both for the Balanescu Quartet). That the First Quartet is based on John Bull’s Variations on the popular song Walsingham and a fragment from Schoenberg’s second String Quartet is of no importance: you don’t need to recognize these borrowings to enjoy this richly inventive and contrasted piece. Assuredly, the music is, at times, pretty and sentimental (third movement of 2nd SQ, short section F of the First SQ, track 14, Quartet No. 3 in general) but not mawkishly so, sometimes sweepingly to plangently lyrical and romantic. String Quartet No. 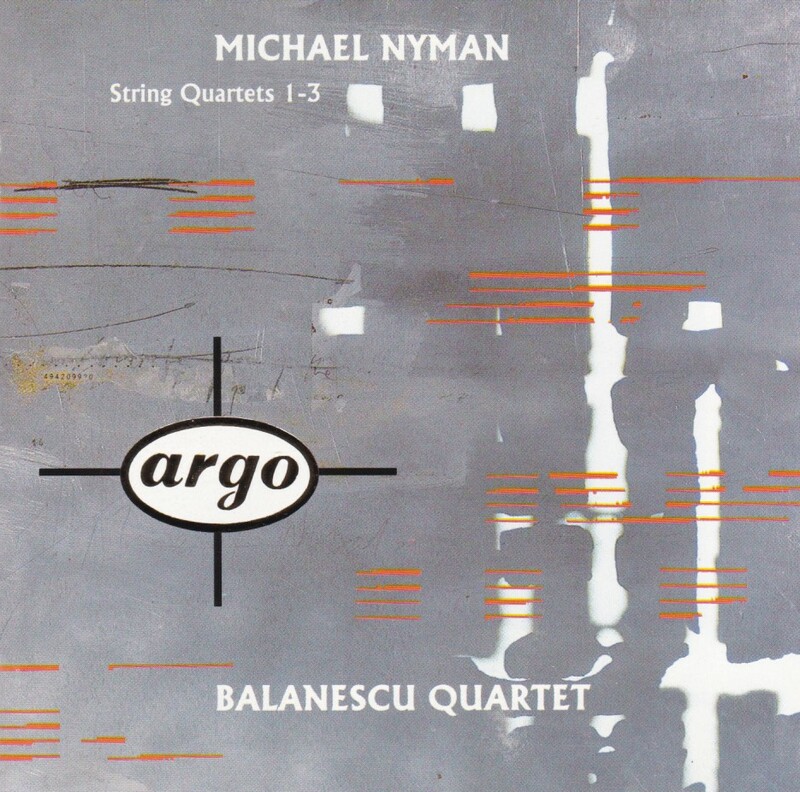 3 in particular, a long mourning dirge written after a choral work that Nyman had composed in the aftermath of the earthquake that had destroyed Armenia in 1988, is the one that fits most my expectations about the sentimental Nyman, but it also has the rent lyricism of the quartets of Janacek. It may be not much more advanced in its language than those of the Moravian composer, but it’s also sonically inventive at times, as in the whistle-like harmonics at the beginning of track 8. Some time after first listening to this CD I purchased the scores of the second and third quartets, and I can testify that under their appealing and easy-listening guise, they present serious rhythmic challenges for the performers, as in the Second Quartet with its different irregular rhythms on each stave. 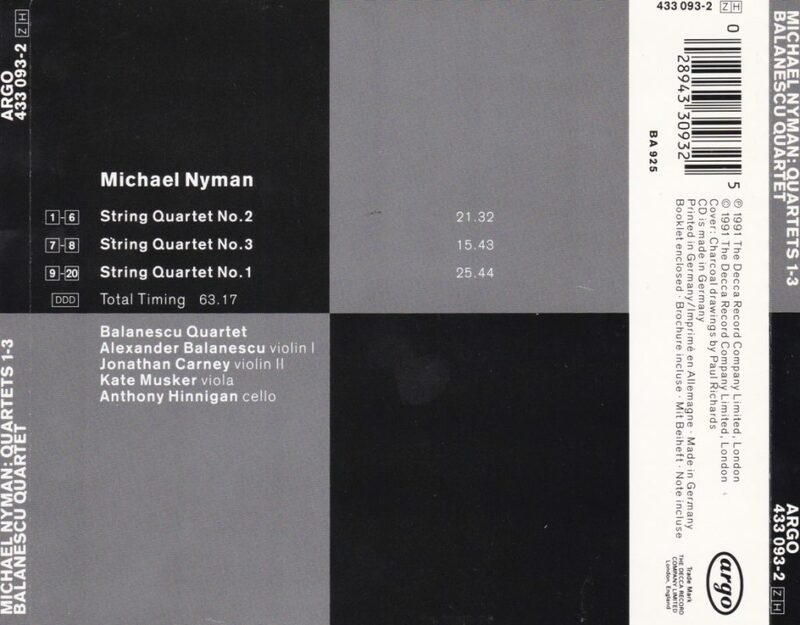 In the invaluable liner notes by Nyman himself, the composer says that “a consistency of compositional approach” in the quartets is what “unifies them and sets them distinctly apart from [his] other works“. Maybe that’s why I enjoyed them. They are typical of the kind of music in which the Kronos Quartet and the Balanescu Quartet seem(ed) to revel, and should please all the admirers of those two ensembles. 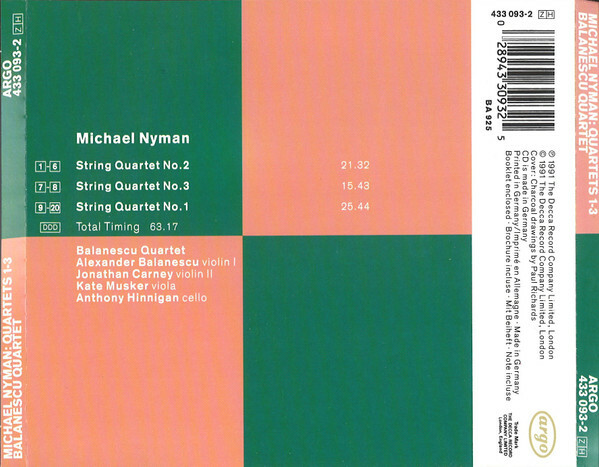 I later bought the alternative version of Quartets 2 & 3 by the Lyric Quartet on Black Box BBM1020, Nyman: String Quartets 2, 3 & 4. 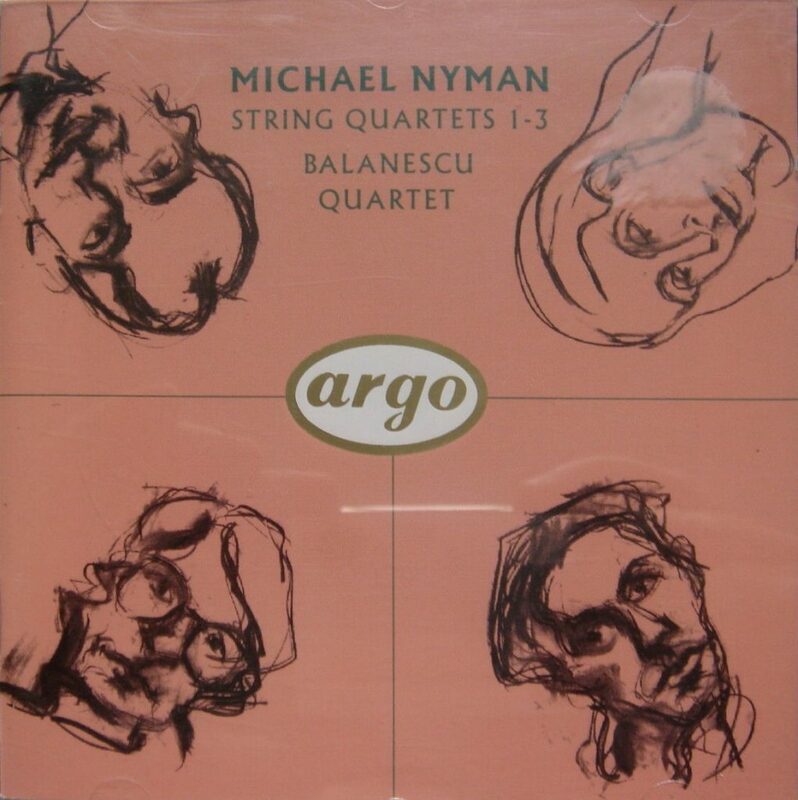 The two versions are very similar, there is no clear-cut superiority of one over the other, but given the Balanescu’s Quartet long association with Nyman and the fact that they premiered the Second and Third Quartets, and also because the Lyric Quartet doesn’t play the Fourth Quartet complete, the Argo disc is to be preferred, and may be complemented with the complete recording of the 4th SQ by the Camilli Quartet, British Composers: Nyman – String Quartet 4.